This is a project I likely should’ve undertaken sooner, but now more than ever it is easier to tackle a lot of the massive films I’ve yet to see. I can likely continue doing it every year and hopefully (eventually) the titles will become more and more arcane to the common filmgoer but no less bothersome for the film buff and/or filmmaker. However, Edgar Wright the very talented director and great film enthusiast has said something quite true on his Twitter, in response to apologetic fans having seen Scott Pilgrim vs. The World, only on video, “It’s never too late to watch a movie.” That’s the spirit in which I’m undertaking this venture. My conscious desire to be in film blossomed much later for me than with most, the pure love of it was always there. Therefore, what I want to see has always been a strong impulse as it is with many. However, once one becomes a student of film you quickly learn there are those titles you ought to see and if you haven’t already seen them watching them on your own, later on, can seem like homework. Whereas in school screenings were the best class assignments you were given, homework is a bothersome thing, no one liked homework, not entirely, and the assignation of necessity to something that ought to be a pleasurable and visceral experience alone can make one reticent to watch certain films. In fact, in the schools I attended I saw the disillusion many students felt as they could no longer enjoy films for they analyzed them to much. I remained steadfast and can control hyper-analysis during viewing and do that legwork after the fact. This is an elongated and roundabout way of saying that some films I have avoided in part because of their stature, for fear that watching them would be more like work than pleasure or conversely for as important as they might be in a historical or technical context I’d not be moved by it in a narrative sense. Well, the time has come and the access to some is so ready that I’ll bite the bullet on many titles this year (ideally at least 52) and I hope you the reader either get a chuckle of what I’ve deprived myself of thus far or find something new to look for, ideally both. And who knows maybe even undertake this challenge yourself. War stories are tough to watch. Rather informed by a making of and needed to distance myself from that viewing. I had forgotten much I’d learned about the plot so all I really expected were a few scenes I knew of and brilliance. At times mesmerized, others horrified and befuddled. A film that works brilliantly on an intellectual and visceral plane and as much as I wanted to see the theatrical and “Redux” cuts before they left Netflix I could not deal with seeing it twice in two days. It’s been far too long since I updated this post but I figured when I do it had better be a doozie. So how does a Hitchcock film strike you. Now, I did add a new Hitchcock both during 31 Days of Oscar and since, but this one is a big one that is a worthy successor to the aforementioned film. I have seen bits and pieces of The Birds, and like any Hitchcock film (any good film) it’s not an experience meant to be fragmentary. 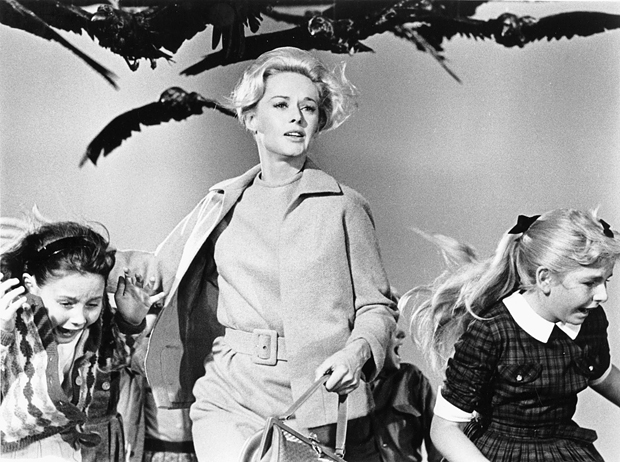 My avoidance of The Birds always came back to a philosophical quandary: How effective can it be when the film openly acknowledges there’s no real catalyst, at least not one blatantly indicated in the story, as to why the birds are attacking? In a B-Film (This is not one, I’m merely contrasting) that deals with animal attacks there will be the discussion as to why, perhaps too much and perhaps the explanation satisfies and perhaps it doesn’t, but it’s there. I was never sure how well it’d work for me, especially stacked up against other Hitchcock films. Guarded, to say the least, yet hopeful that it’d be the best rendition of the story at hand, and potentially bulldoze my reservations. The first thing that really struck me is the importance of the MacGuffin in this film especially. The MacGuffin is really just a device that is used as an excuse to tell the story, but in The Birds, without the flirtation and the new-found connection the two protagonists share, without her coming to Bodega Bay, meeting people; essentially introducing herself into a new family, it’s hardly different than many animals attack movies. However, you do spend that time building characters, relationships and attachments, the story is about them, and the attacks of the birds mount incrementally. They come intermittently and with growing intensity. The lack of scoring was something I knew about going in but I must say that it really does contribute to making this film as good as it is. It’s not going to work for every film but a certain intimacy and terror are built in just by hearing the flapping of wings. I am a bird-lover, member of Audubon and all that but I take no issue with this film in that regard particularly because of how Hitchcock executes it cinematically. Birds aren’t usually a feared animal, so to transform the sound of a flock of flapping wings into something fearful is quite a feat. Hitchcock’s is a filmography with so many greats, and so many personal favorites that many overlook, that it’s hard to gauge this film, even in the context of his canon, but it is undeniably solid and effective.